Apple's U.S. Patent No. 9,565,490 for "Dual mode headphones and methods for constructing the same" details a headphone system —over-the-ear, on-ear or in-ear — capable of switching operating modes from personal listening to speaker depending on its orientation. 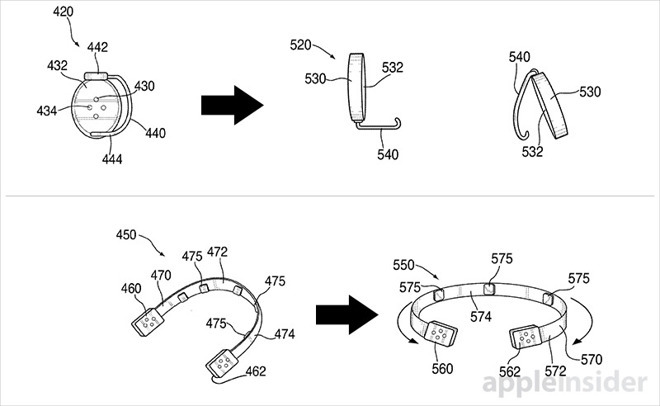 Apple proposes utilizing designs similar to headphones currently on the market. A basic over-ear style, for example, includes two ear cups containing drivers and operating circuitry, connected by head strap. Apple's invention adds in specialized sensors and amplifier circuitry that allows an ideal headphone to operate as a standalone loudspeaker. Controlling output volumes are onboard sensors that determine the headphone's current position, its orientation in space and proximate location to a user's head. For example, when the driver cups are facing inward and the proximity sensor detects a nearby object, thus indicating on-head use, the device bypasses the built-in amplifier. Once a user activates "speaker mode," perhaps by flipping the ear cups outward and laying the system on its side, output volumes ratchet up to loudspeaker levels. On-ear headphones like clip-on models, as well as in-ear formats like EarPods and the new AirPods, are also compatible with Apple's invention. The same sensor and amplifier arrangement applies, but on a smaller and more compact scale suitable for use with pint size driver and armature designs. Alternative embodiments include a snap band headphone, the ability to actuate speaker mode manually via a button interface, support for external amplifiers, secondary sound ports for earbud style headphones and more. Whether Apple plans to bring the dual mode headphone system to market is unknown, though the company accomplished a similar feat with its latest iPhone 7 lineup. The current generation smartphone boasts a speaker arrangement that produces stereo sound when the device is in landscape mode, a technology introduced with the 12.9-inch iPad Pro and later adopted by its smaller 9.7-inch sibling. Instead of integrating four discrete loudspeakers at each device corner, as it did with iPad Pro, Apple cleverly amplifies output from iPhone's ear speaker, a component traditionally used solely for phone calls. Speaker volumes return to standard handset listening levels when onboard sensors determine iPhone is in portrait mode and near a user's head. Perhaps more telling is Apple's AirPods. Proving the invention can indeed be implemented in an earbud design, the new wireless earbuds incorporate both motion and proximity sensors, as well as intelligent onboard processing for pairing, communications and other advanced functionality. AirPods even include a take on the "earbud as speaker" concept with "Find My AirPods," which helps users locate a lost bud by playing a loud pinging noise. The lost-and-found feature does not incorporate a discrete amplifier, as detailed in today's patent, but the basic idea is there. 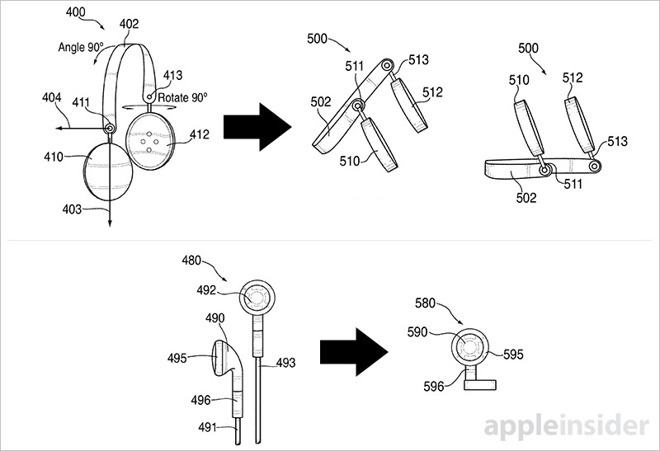 Apple's dual mode headphone patent was first filed for in May 2011 and credits Edward C. Hyatt as its inventor.